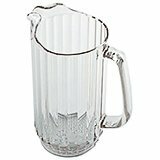 From virtually unbreakable polycarbonate that has the crystal clear look of glass to clear acrylic and other commercial grade materials, our pitchers are lightweight for easy handling. 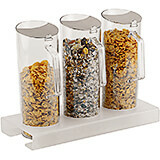 Available in different styles and sizes can manage liquids and solid foods such as cereals. 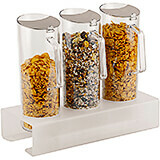 They have the crystal clear look of glass, but are made of virtually unbreakable polycarbonate. 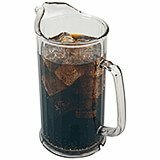 Lightweight for easy handling.A thumb-grip pour control, exclusive ice-control contoured lip and pour spout reduce spills. Slotted base helps drain water for complete and sanitary drying. An industry standard. Broad base for stability, prevents tipping. Capacity calculated to rim. Contemporary styling. Broad base for stability prevents tipping. 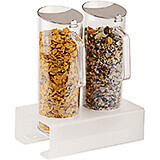 They have the crystal clear look of glass, but are made of virtually unbreakable polycarbonate. Lightweight for easy handling.A thumb-grip pour control, exclusive ice-control contoured lip and pour spout reduce spills. Slotted base helps drain water for complete and sanitary drying. An industry standard. Capacity calculated to rim. Three position lid can strain ice, free pour or close to protect contents. 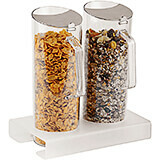 They have the crystal clear look of glass, but are made of virtually unbreakable polycarbonate. Lightweight for easy handling.A thumb-grip pour control, exclusive ice-control contoured lip and pour spout reduce spills. Slotted base helps drain water for complete and sanitary drying. An industry standard. Broad base for stability, prevents tipping. Capacity calculated to rim. Tapered design and drip-proof spout. They have the crystal clear look of glass, but are made of virtually unbreakable polycarbonate. 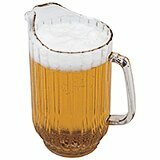 Lightweight for easy handling.A thumb-grip pour control, exclusive ice-control contoured lip and pour spout reduce spills. Slotted base helps drain water for complete and sanitary drying. An industry standard. Broad base for stability, prevents tipping. Capacity calculated to rim. 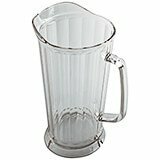 7.125" X 7.125" X 11.5"
The Paderno World Cuisine 3 quart acrylic juice pitcher comes with an ice insert Material: Plastic.Capacity: 3 Qt. 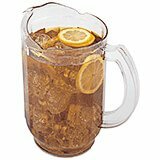 6.5" X 6.5" X 10.25"
The Paderno World Cuisine 2 1/8 quart acrylic juice pitcher comes with a lid. 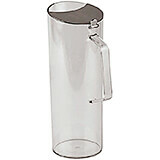 Material: Plastic.Capacity: 2.13 Qt. 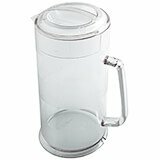 10.125" X 6.125" X 11"
10.125" X 6.125" X 12.625"
The APS Paderno World Cuisine Plexiglass cereal jug has a capacity of 1.6 quarts. 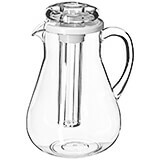 The jug has a vertical handle for easy pouring. 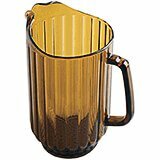 The lid is hinged on the side and opens and closes easily for quick pouring. 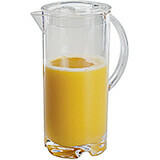 These jugs are a necessity in cafeterias, buffets and breakfast bars. 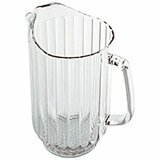 This jug can be used alone or as a replacement in the bases of other cereal jug sets, such as items 41918-03, 41918-04, 41918-01 and 41918-02. Material: Polycarbonate.Capacity: 1.6 Qt. 15" X 6.125" X 11"
15" X 6.125" X 12.625"